** Originally published in the July-August 1990 issue of The Crabbet Influence magazine. Indian Magic (Raktha x Indian Crown, Raseem) – 1944 Arabian stallion bred by Lady Wentworth of Crabbet Stud. Once one starts looking for Indian Magic descendants in Europe, one finds more and more, sometimes in quite unexpected places. The following summary of Indian Magic breeding in continental Europe is of necessity brief and doesn’t pretend to cover everything there is, which would be impossible within these limits. The European country with the largest number of Indian Magic descendants is Holland. Most of the early foundation stock of that country was imported from Britain; later, the majority of imports came from Russia, and importations from Poland, Spain, and Egypt increased while those from Britain decreased. Still, Arabian breeding in the Netherlands rests on a solid Crabbet foundation and the Crabbet/Russian cross has become the most outstanding achievement of Dutch breeding. Among the numerous imports from Britain in the 1960s and 1970s, there were 15 stallions and colts and 12 mares and fillies descended from Indian Magic, including four direct get: the stallions Babur 1971 (x Roshina) and Hindostan 1969 (x Indira) and the mares Magic Gold 1966 (x Magnindra) and Shakra 1959 (x Rissada). Neither of the two Indian Magic sons left descent in Holland, but Babur was sold to Belgium and is still at stud there today. I do not know what became of Hindostan. Both mares were used for breeding and Shakra founded quite a family. Her daughter Al-Madina, by *Achim NSB 300044 (1967), was the dam of the licensed stallion Rondeels Jof and her daughter Rondeels Jacaranda (1974) was exported to Britain. Orinda (Hoekhorst Shiraz x Nephrim), owned by Suzy Pirard, Belgium. She was World Champion Mare at Paris in 1988. Of the 15 male Indian Magic descendants imported to Holland, only five were used for breeding there (two others were exported and used elsewhere): Jedaan 1963 (Blue Domino x Shakra, by Indian Magic), Lurex 1968 (Ludrex x Yemama, by Indian Magic), Rissaz 1965 (Indriss by Indian Magic x Kazra), Romeo Boy 1972 (Silver Rain by Indian Magic x Rose (iiu)), and Valiant of Yeomans 1972 (Nizzolan x Miss Valentine of Yeomans by Indriss). The stallion used most, and most successful with his offspring, was Rissaz. Three of his daughters, Risico, Risham Torsi, and Farce Mineur, produced stallions that were licensed in two countries-Risico’s son Bajadere and Risham Torsi’s son Squire of Risham (by Lurex, and thus double Indian Magic) were sold to West Germany. Rissaz had three breeding sons, Oosterveldt’s Marsaz, Hoekhorst Shiraz, and Pandaz, of which Hoekhorst Shiraz has the distinction of having sired a World Champion, the mare Orinda who is owned by Suzy Pirard of Belgium. Pandaz, who was foaled in 1976 and is out of the Aswan mare Pandora, was leased for two seasons to Lodge Farm in England, the breeders of his sire, Rissaz. Lurex, the most look-alike of the Indian Magic grandsons, also did well. Besides collecting numerous championships in the show ring, he sired two breeding stallions, Pjotre van Dennenoord out of a Russian mare and Luck out of the English import, Aunt Cara. Aunt Cara was one of the most successful English imports to Holland and herself descended from Indian Magic through her dam, Raffinda, who was by the Indian Magic son, Indian Fakir. She produced a whole string of successful foals in Holland, including the above mentioned Luck, the stallions Jaguar, by Gon, and Apollo van Heel, by *Abdullah 277145, and the mare Roos, also by *Abdullah, who did very well at international shows and later went to Italy as a foundation mare. However, Aunt Cara’s half-sister Zelda possibly outdid her, if only by producing Naomi, by Darjeel. Naomi, who was of course pure Crabbet/Old English, produced the lovely World Champion Amal, again by *Abdullah. Amal’s sons and daughters are a presence very much felt in European show rings at present. 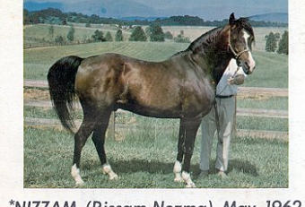 His son Aichal was sold to West Germany and was licensed for breeding at two years of age, after having been named Reserve Champion Colt at his very first show. Naomi’s younger son Hamourabi, by Warandes Plakat, is also doing well and was licensed in Belgium last year. Another Indian Fakir daughter, Hamu, was also imported to Holland together with her filly Indian Zasha, by Indian Flame II, who was double Indian Magic. Hamu’s most successful produce in Holland is the 1972 mare Minouche, who has produced several prize-winning daughters, mostly by Plakat. One of them, Beeghom, was exported to West Germany. The Indian Magic granddaughters Sky Minuet 1975 (Indriss x Masqueen) produced the rather curiously named Mr. Richards van de Coryon, by the Egyptian Hamasa Zarif, a fine liver chestnut stallion who is also doing well in Holland. Arabian breeding in Belgium is heavily linked with Holland, since the two countries are next to each other and there is a frequent exchange of breeding stock. With 19-year-old Babur, Belgium can currently lay claim to having the only living Indian Magic son in continental Europe. Of 59 purebred stallions licensed for breeding in Belgium in 1989, 9 were descendants of Indian Magic. Sheer Insouciance (Crystal Majesty x Sheer Scindiscretion) imp. from England. Torrero (Gon x Risham Torsi by Rissaz) bred in Holland. Rishmars Salazar (Carrick Crystif x Salonica) imp. from England. West Germany is a country where English bloodlines are popular only with a small minority; nevertheless, it also has its share of Indian Magic blood. The stud book lists 11 English mares descended from Indian Magic, including three Rissaz daughters imported from Holland; the others are from England, and all are or were used for breeding. 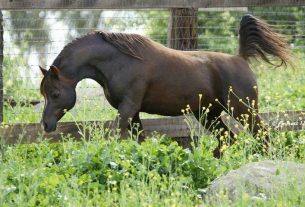 The Indian Magic granddaughter Halo’s Miracle (Blue Halo x Rare Magic), imported in 1972, is so far the most successful. Her champion daughter Rikada has produced two licensed stallions and a very beautiful mare, Radina, who appears in Western riding demonstrations across the country. Shiriba (Crystal King x Hadassa), who traces to Indian Magic through her sire, was a regional champion last year and has several successful daughters. However, most of these mares are owned by small breeders who don’t do much showing. There are at present 10 licensed stallions in West Germany which are descended from Indian Magic. First and foremost is Lurex, mentioned above under Holland. Lurex was actually imported first to West Germany in 1970, then sold to Holland a few years later without leaving any offspring. In 1981, after having made a name for himself in Holland, Lurex took part in a major international show in Germany where he won the stallion championship, beating the phenomenally successful Plakat. Shortly after that, he was purchased by German breeder and Crabbet enthusiast Dr. Reeber, who has owned him since then. He has not been heavily used in Germany but does have some get, including the stallion Squire of Risham, who is an active trail and endurance horse with Dr. Reeber’s daughter. Aichal (Amal x Aicha) imp. from Holland. Aziz Agamemnon (Ahmoun x Kamisha) imp. from England. Bajadere (Mufag x Risico by Rissaz) imp. from Holland. Brave Warrior (Magic Argosy x Nourella) imp. from England. HH Raskal (Gharib x Rozita by Samba) bred in Germany. Indian Fire (Indian Flame II x Yanni) imp. from England. Safrano (Aboud x Dancing Rose) imp. from England. The most recent of these imports, Safrano, has been very successful. He was regional champion at his first show and passed his stallion performance test with very high marks, only missing class I by 0.5 points. Switzerland is another country which, like Holland, initially imported its foundation stock from Britain and later switched to other countries, in this case most notably Spain and Egypt. 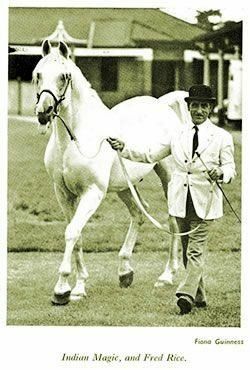 Of the Swiss foundation horses, several were Indian Magic descendants, including the influential stallions Silver Spurs (Silver Rain by Indian Magic x Jael) and Shah Jehan (Sha’ir x Saidi). Shah Jehan traced to Indian Magic through his sire Sha’ir whose second dam was the Indian Magic daughter *Mellawieh 20425. He sired many broodmares and a well known licensed Shagya-Arabian stallion, Shamasi, who is also a successful eventer – a rather unusual venue for a horse of Arabian breeding. Among the English mares imported to Switzerland was one Indian Magic daughter, Kamelia, who was out of Kazra, which made her a ¼ sister to Holland’s Rissaz. Kamelia’s owner, Mrs. Ursula Rahm, also imported the Indian Magic granddaughter Aphala (Scindian Magic x Shifala) who produced the fine stallion Arkit. Other imports include the two mares Eastern Legend and Eastern Charm, by Eastern Magic, a son of *Touch of Magic 30310 and his only son who ever stood in Britain. France has at least one line to Indian Magic through the mare Vandella, a daughter of the Indian Magic grandson Magic Argosy. Vandella was the foundation mare of the Domaine de Maury stud. Bred mostly to Polish and Russian stallions, she produced the successful stallions Vanrex de Maury (by Alrex), Valery al Maury (by Diarex), and Viking al Maury (by *Nego 299881), and the mare Vanessa al Maury (by *Arbo). All have done well at international shows. Italy has been importing at a furious rate during the last few years, principally from Britain and Holland but also from Poland, West Germany, and Denmark. Since modern Arabian breeding in Italy is still in its infancy, one can’t really judge which influences will turn out to be the strongest in the long run. However, Indian Magic blood has already arrived on the scene from various sources: the Amal sons Asmar and Abdesalam and the Aunt Cara daughter Roos from Holland, the stallion Indian Rakosi from Denmark, and of course various imports directly from Britain. The Scandinavian countries have been breeding Arabians for many years, mostly with a strong emphasis on Polish bloodlines. But some foundation horses came from Britain and also left their mark and several of them were descended from Indian Magic. 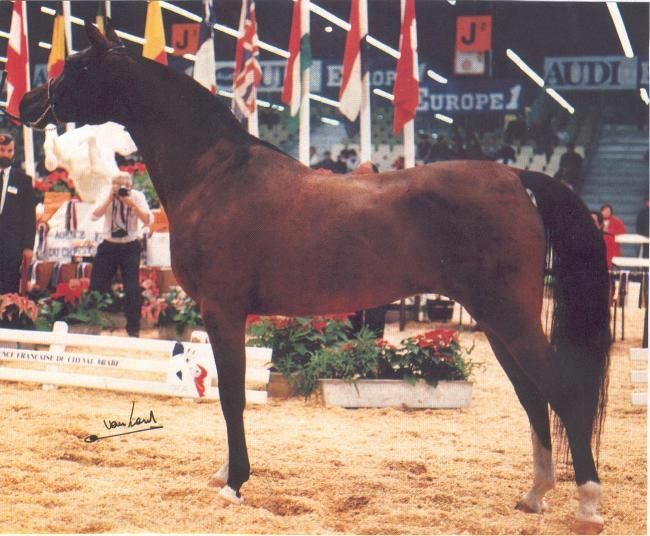 The Crabbet-bred stallion Samba (Bright Shadow x Simra by Indian Magic) was one of them; he was later sold to West Germany where he might still be living, but in any event he no longer breeds. His daughter Rozita was also exported to Germany and is the dam of the licensed stallion HH Raskal. In Denmark, the stallion Indian Grodust is descended from Indian Magic through his dam Indian Stardust, and Indian Magic granddaughter. He is the sire of the above-mentioned Indian Rakosi and of the two mares Indian Silla and Indian Yasmine who were also sold to Italy. The Indian Magic granddaughter Crystal Haze (General Grant x Comforts Caravel) produced several foals in Sweden, as has Shamina (ex Futti), a granddaughter of the Indian Magic son Shirar, in Denmark. Denmark was also the home of Chimene (Ali Ban x Indian Trinket), and Indian Magic great-granddaughter. Chimene’s daughter Aziza was sold to West Germany and has produce there. Since I do not have the Scandinavian stud books, this part is particularly sketchy, being based almost entirely on horses which were exported from Scandinavian countries. Nevertheless, it should serve to give a brief impression. Finally, not to be forgotten, there are Arabians in Austria as well, and there is a licensed stallion, Roy, whose dam, Luisa, is a granddaughter of the Indian Magic son Indian Flame II. This brief survey should illustrate that Indian Magic blood is present in all European countries where Arabian breeding is mostly in the hands of private breeders, rather than state and/or military stud farms.